Are you looking for a Western snow plow in Edmonton or Prince George? IOR specializes in Western snow plows, snow plow parts and snow plow equipment. Western is considered the leading manufacturer of snow removal products and equipment. If you are looking for a commercial snow plow or a personal-use and light municipal snow removal equipment, you can rely on Western. 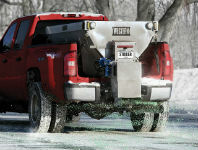 IOR carries a wide range of Western Products including tailgate-mounted ice control sanders and salt spreaders. IOR also offers a wide selection of performance-enhancing snow plow and spreader accessories and parts.